On 10 August 1519, five ships departed from Seville for what was to become the first circumnavigation of the globe. Linked by fame to the name of its captain, Magellan, much of the expedition is known through the travelogue of one of the few crew members who returned to Spain, Antonio Pigafetta. A narrative and cartographic record of the journey (including 23 hand-drawn watercolour charts) from Patagonia to Indonesia, from the Philippines to the Cape of Good Hope, Pigafetta's The First Voyage around the World is a classic of discovery and exploration literature. This volume is based on the critical edition by Antonio Canova. It includes an extensive introduction to the work and generous annotations by Theodore J. Cachey Jr who discusses the marvelous elements of the story through allusions to Magellan's travels made by writers as diverse as Shakespeare and Gabriel García Márquez. However, Cachey is careful to point out that Pigafetta's book is far from just a marvel-filled travel narrative. 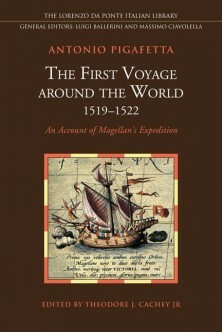 The First Voyage around the World is also a remarkably accurate ethnographic and geographical account of the circumnavigation, and one that has earned its reputation among modern historiographers and students of the early contacts between Europe and the East Indies. Expertly presented and handsomely illustrated, this edition of Pigafetta's classic travelogue is sure to enlighten new readers and invigorate the imagination as the story has done since it first appeared.